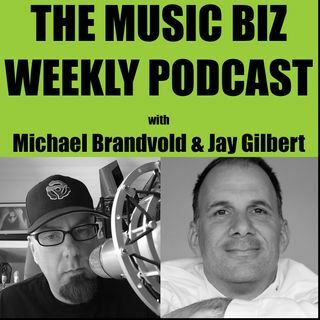 The Music Biz Weekly, a weekly podcast hosted by Michael Brandvold and Jay Gilbert. Each week we will discuss the latest events in the music business and music marketing and DIY techniques. Michael Brandvold is a freelance music industry consultant based in Northern California. Having launched Michael Brandvold Marketing to leverage his years of experience to provide direction to large and small clients in the areas of online & social marketing as well as e-commerce and customer ... See More acquisition and retention. Gene Simmons of KISS first tapped Michael's skills as a pioneering online marketing strategist to launch and manage all aspects of Kissonline.com's multi-million dollar enterprise, including their ground-breaking VIP ticket program. Michael has also managed the online efforts for KISS, ACCEPT, SOiL, Tantric, Killer Dwarfs, Dream Theater, Little Caesar, Narada Michael Walden, Motley Crüe, Rod Stewart, Madonna, Ozzy Osbourne, Madonna and Britney Spears to name only a few. As a teenager in the Pacific Northwest, Jay Gilbert smuggled his Canon AE-1 into rock concerts to get the perfect shot of the likes of Van Halen, Queen and Cheap Trick. After college, he toured as a musician gaining invaluable experience in what it takes to create and promote an album. He later translated that knowledge as an executive with Universal, Sony and Warner Music Groups. He moved to San Francisco and finally to Los Angeles for Universal Music where he worked for 18 years, most recently as VP New Media for Universal Music Enterprises. Jay has been on the cutting edge of Digital Sales & Marketing with Universal, Starbucks, Fox and Warner Music. It is this unique perspective as a musician, music executive, and fan that makes Jay‘s approach to Online Marketing artist-friendly. It's Friday & You Just Dropped Your New Release, Now What Do You Do? Ari Herstand – Digital Distributors, Spotify Listeners and More! Do You Understand Your Recording Contract?